Custom and Cheap Plantar Fasciitis Treatment with ESWT system Supplier and Manufacturer.--Lumsail Industrial Inc. Custom and Cheap Hair growth laser,Shockwave Therapy,Skin Analyzer,LED PDT Phototherapy,HF vascular removal Supplier and Manufacturer. 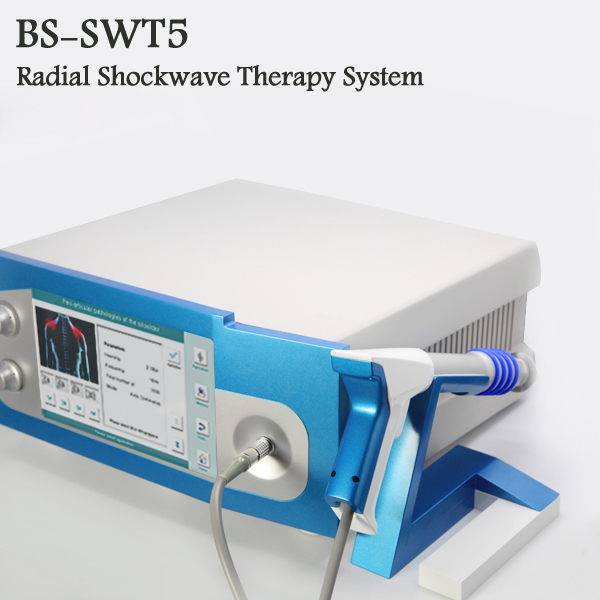 BS-SWT5 is a professional Radial Shockwave Therapy (RSWT) system, which is a method for the treatment of superficial orthopedic disorders developed over the past 20 years especially for pain associated with the musculoskeletal. A shockwave is defined as a wave with a rapid increase of pressure within a very short time and then having a gradual decrease of pressure with a small negative pressure phase. Shockwaves are aimed at the affected areas that are the source of chronic pain. The influence of the shockwaves causes to the dissolution of calcium deposits and leads to better vascularization. The after-effect is relief from the pain. The BS-SWT5 SWT system uses the ballistic principle of shockwave generation: A pressure wave is formed via a projectile by using accelerated compressed air. The compressed air is generated by an electronically-controlled ballistic-pressure compressor. Using elastic impact, the kinetic energy of the projectile is transferred into the probe of the applicator and then into the client's body. Consequently, during the treatment, the end of the applicator must be in direct -contact with the skin and subcutaneous tissue. - User can save settings and rename the settings. - Big touch screen control panel and knobs for easy-tuning with single finger. - Pain trigger-points or painful points in muscles..
A: We support bank wire transfer to our company’s account.Paypal or Western unio is also acceptable.